Like lots of owners of a the Skywatcher HEQ5/Orion Sirius EQ-G I was frustrated by the lack of a polar scope dimmer. Although in theory the polarscope illumination on mine is designed to be of a brightness to screen out any stars in the area around the celestial pole EXCEPT Polaris I often found the skies were so murky that with the polar scope illuminator running I couldn't see Polaris ! With this in mind I resolved to find a solution. People who know my guides and my general attitude to 'fixes' know I like my solutions to be as elegant as possible. Fitting a simple adjustment control proved to be quite a long search. 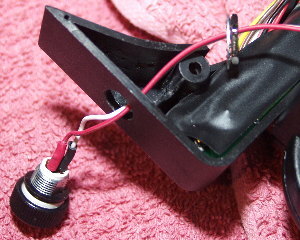 Most potentiometers were too large to create anything except a solution that would look unsightly. Eventually a few months ago I came across a unique cermet style potentiometer available from RS components (the manufacturer is Vishay and their part number is P16-PA16) where the bulk of the mechanical components is in the 'knob' part of the component. This allows the unit to occupy the minimum space on the other side of any control panel and made this component suitable for fitting to the HEQ5s main power/handset module. After experimenting with various resistance values I settled on 470k ohm as the optimum giving a good range of brightness for the polar illuminator. The steps below show the process to install this component and I think you will agree the final pictures of the polar illuminator brightness control when fitted to the mount make it look as though it was installed at the factory. CAUTION: If you follow this guide I take no responsibility for any damage arising. This is a procedure that is easy enough for anyone competent with a soldering iron and comfortable working with electronic components but you need to exercise maximum care at all times. Damage can easily result to the mount through careless handling during this procedure. This guide is a GUIDE - it relies on you also exercising good sense and judgement. 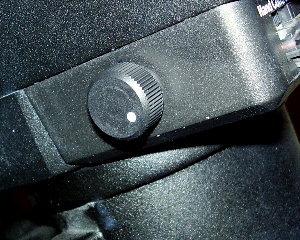 Place the mount on a soft, static free surface. Remove the 6 screws around the motor cover. Remove the motor cover. You will also need to remove the curved cover. 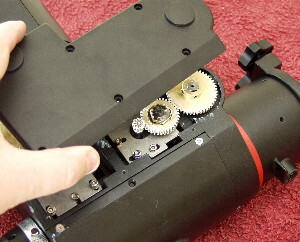 This is held by 2 or 3 screws under the motor cover and three screws on the opposite side of the mount. 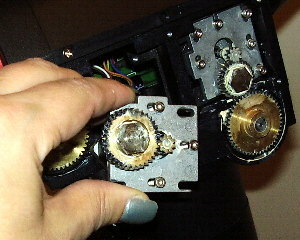 Remove one of the motors. I found the RA was the best one to remove. This is the RA motor. Remove only the screws that hold the motor to the mount. The screw holes are shown here highlighted in red. Here is the RA motor being removed from the mount. I placed mine into a small polythene bag and taped mine to the mount temporarily to stop it flopping around while other work was in progress. From the opposite side of the mount to the motors you will see the motor control board. On this board you will see a small connector with two pins. It has two wires. Black and Red. Take suitable static precautions and then gently remove this connector using the tip of a small screwdriver or some small pliers to remove the connector from the socket on the board. Now remove the polarscope LED ring. This is a small plastic ringed LED arrangement that is plugged into the RA shaft. 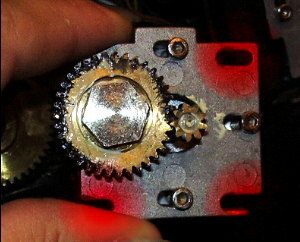 It is located below the RA motor. You can see in the picture the unit being removed using some snipe nosed pliers. You may need a thin bladed screwdriver to gently prise it away to start with. 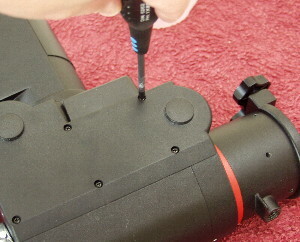 Remove the entire polarscope assembly with its lead and connector from the mount. Here is a diagram of what you should have removed from the mount. 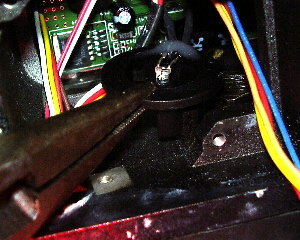 The polarscope illuminator attached to two wires and the motor control board connector. This is a diagram showing what you need to do. The red wire is cut and you need two lengths of wire to run to and from the potentiometer. DO NOT solder the potentiometer ends of the wires at this stage. Simply cut the red wire at its mid way point and add some extra red wire to each cut end. Around 8" of wire will be about right to each end. Solder these to the existing wire and cover the joins with either heat shrink insulation or rubber boots. Now reinstall the polar illuminator and the connector and remove the mounts power panel. The panel is held by two phillips screws underneath. Run the extension leads you installed through the cut out where the other power panel connectors to the PCB run. You now need to drill a hole suitable for the potentiometer which should be around 10mm (check this with the potentiometer). 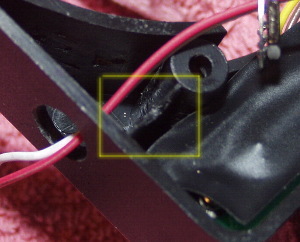 You can see in the following picture the hole falls just to the side of a plastic strut inside the power panel moulding. 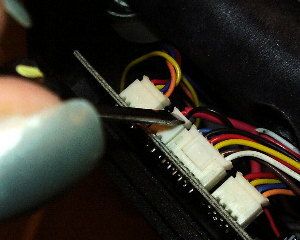 You will need to size this yourself making sure the potentiometer has enough clearance all around. Once the hole is drilled thread the extension ends of wire onto the lock washer and nut of the pot and push the wires through the hole. Here is the assembly almost completed. Note the nut and washers for the pot are threaded onto the cable. The wire ends are now soldered to the pot and are covered in heatshrink tubing. 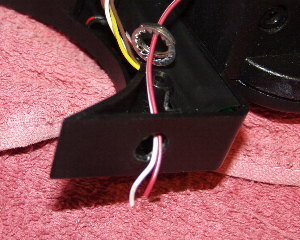 The red wire in this picture leads directly to the PCB connector and is connected to the centre pin of the pot. The white wire leads to the LED and is connected to either of the pots outer pins. Note that the small reinforcing part of the power panel moulding has been cut back a little to let the wire pass through easily when the power panel is reinstalled. Push the potnetiometer into the hole and tighten down the lock washer and nut. You will find this quite fiddly as there is little space for the pot. Take your time and be patient. Its perfectly possible to do this. Thread all of the cables back into the mount and tuck them into place. Ensure no cables are fouling any part of the mounts mechanical movement. Replace the motor you removed earlier and make sure it is seated and aligned well to the mounts gears.Reinstall all covers and test.